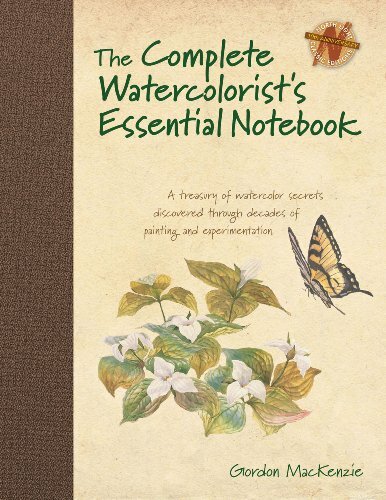 The Complete Watercolorist's Essential Notebook is one large book. A 288-pages hardcover. It's actually two books in one. It collects The Watercolorist's Essential Notebook and The Watercolorist's Essential Notebook: Landscapes. In this 10th anniversary edition, you'll be getting 2 books for the price of one. A deal not to be missed because they are terrific books. The book is a beginner's guide to learning watercolour painting. It's loaded with useful tips and techniques. The techniques discussed involve painting techniques and the general art application like understanding perspective, composition, balance, etc. Information can be quite detailed at times. There's a chart comparing the paint quality across different brands, something I don't see in other books. There's also information on how you can construct your own palette, if you like to do it yourself (DIY). The examples are great and they are all hand drawn. And the many paintings included are wonderful to look at. Highly recommended watercolour instructional book. Useful for reference as well.